Let’s listen to some Ken Nordine while thinking about Circuit Playhouse’s excellent production of RED, a Tony Award-winning play about abstract expressionist painter Mark Rothko, shall we? Why Nordine? I’ll get around to that. But I like the playful way he uses language to express the many moods of colors like magenta, maroon, burgundy, and black. Rothko would have hated it, and somehow that only seems appropriate. 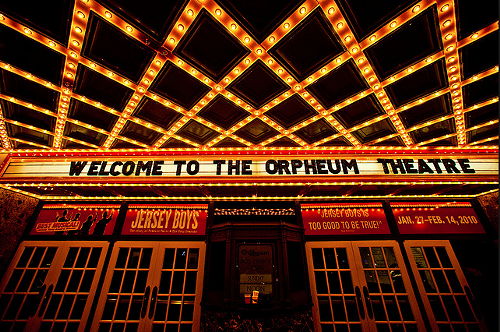 Before each night’s performance the lights go down. 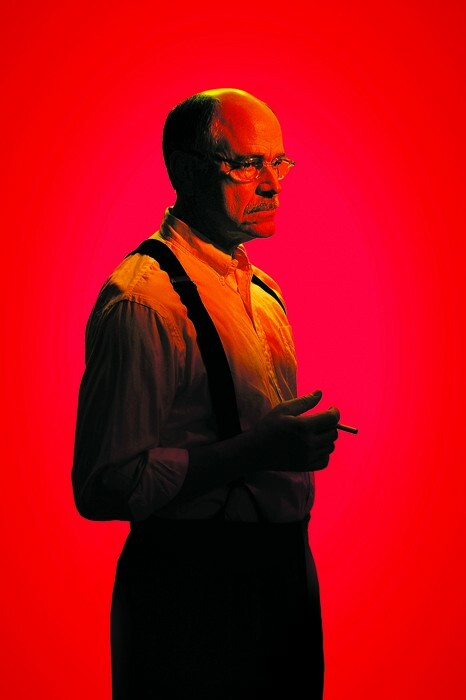 Blackness swallows all the red in a way that the Rothko of playwright John Logan’s imagination says he fears like death. But the vanished colors return almost immediately, more vibrant than ever when the light comes up on Tony Isbell giving what may be the strongest performance of his acting career. There he is, front stage center: Rothko, the opinionated, self-infatuated brat painter whose work and ideas will be celebrated and challenged over the course of one vigorous act. Isbell stares hard, and wordlessly into the audience, but he’s not looking at any person. He’s looking at something else. Or through something else. He adjusts his gaze and looks even harder. “What do you see,” he asks at length, and so begins an hour-and-a-half of overly-familiar plot devices loosely stitched together in a way that is far more riveting and revealing than it has any right to be. So what do we see when we watch this catfight between a famous historical figure and a fictional assistent created for no reason other than to give the famous guy somebody to argue with? Are we dupes caught up in a hackneyed play where characters speak in ridiculous monologues, sometimes revealing dark, difficult secrets? Or is this rollicking hero’s journey that moves from one patricide to the next with less subtlety than a Doors song? Could it be a smug middlebrow romp where culturally significant brand names like Shakespeare, Nietzsche, Jung, and Freud aren’t so much dropped as slung around like fertilizer? Or a soap opera where drama-prone characters fret and fight like they’d been cut out of a Roy Lichtenstein painting? Yes to all of that, and all for the best. RED , a study in conflict, contrast, and irony opens a window onto Rothko’s world after the artist has been offered $35,000 — a vast sum at the time — to create a series of murals for the Four Seasons, a fancy New York restaurant opening in the Segrams Building, an international style skyscraper designed by Mies van der Rohe. Now the uncompromising artist who criticized Picasso’s “ugly pots,” is forced to confront the commodification of his own work at a time when Pop artists like Andy Warhol and Robert Rauschenberg are threatening to make even his interior monologue obsolete. It’s not easy to talk seriously about seriousness or to keep a straight face while saying lofty things about the importance of paintings with tragedy infused into every brush stroke. But the more Isbell’s Rothko talks— and boy does he talk— the more obvious all the little tragedies become. And somehow all of this cartoonishness and cliche leaves us with the impression that we’ve experienced something rich, real, and rewarding. This is pop art for playgoers. The great Rothko condemned to live forever inside a commodified Hell: Black swallows red, red swallows black, and so on. Christopher Joel Onken delivers a nice, understated performance as Ken, a younger artist hired to make coffee and prime canvases. He is especially good in a scene where he and Isbell brainstorm together attempting to take the idea of red and break it down into dozens of more specific colors with a variety of even more specific emotionally-charged descriptors. For what it’s worth, this nearly musical passage is what reminded me of Ken Nordine, who launched his own unusual recording career in the late 1950’s at just about the time Rothko would have been working on the Four Seasons project. I’ve seen several superb productions of plays over the past year: Hurt Village, Angels in America, A Steady Rain, and Time Stands Still all leap immediately to mind. 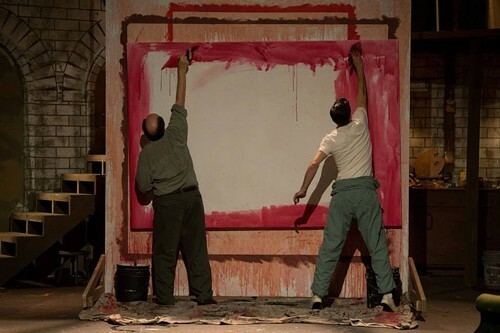 As insubstantial as it might seem going down, RED, directed by Brian Fruits, is as satisfying as any of them and Isbell’s performance as Rothko is not to be missed. Time and ticket information, HERE. Perfectly Miserable: Playhouse on the Square improves "Les Miserables"
Could it be that the potency of Les Miserables has been dampened by too much spectacle in previous incarnations? Will it only live up to its real potential as regional playhouses reconsider theatrical priorities, and work to fit the epic musical onto smaller stages? The grandest thing about POTS triumphant (yes, I said triumphant) production of Les Miserables (other than the costumes, perhaps) is a nearly complete absence of grandness. Mark Guirguis’s scenic design is too useful and sturdy to inspire much awe. Sets are subtle and constructed with actors top-of-mind, not theater tourists. This is the perfect stage for a performer’s production of a show that, in its heyday, defined the modern, spectacle-driven mega-musical, while standing head and shoulders above most of its big budget peers. Instead of investing in technological marvels POTS director Gary John La Rosa has doubled down on the power of good singing, unfussy acting, and clear storytelling. To do so, he’s brought together some of the best voices I’ve encountered on a Memphis stage. Or any stage for that matter. The big payoff is an evening of genuine intimacy from a show that usually overwhelms. Performances by leads and chorus members alike are first rate and fully packed. Jordan Nichols, a veteran of a retooled and re-launched Les Miz national tour, wears the role of Marius like a comfortable suit, but he's only one bright light among many. 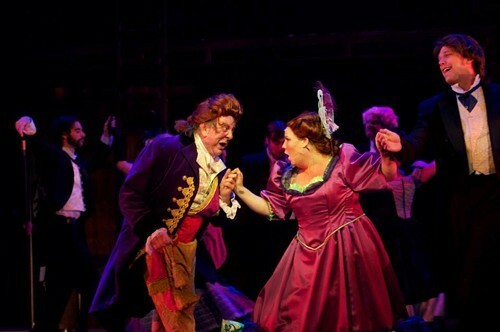 Regional favorites Ken Zimmerman and Courtney Oliver are deliciously seedy as Thenardier and his Madame, who cut purses, rob corpses, sell sin and profit at the margins in war and peace alike. If this were a Disney cartoon these survivors' survivors might be played by a pair of sharp-toothed sewer rats, and something very near that level of anthropomorphism occurs each time Oliver and Zimmerman scamper onto the stage. Yet they remain all too recognizably human. Claire Hayner, a statuesque performer known for playing strong female roles, is uncommonly vulnerable and heartbreaking as Fantine and Michael Detroit gives a credible, no nonsense performance as the undeveloped lawman, Javert. This is Jean Valjean’s show, of course, and with his powerful build and angel’s voice Philip Andrew Himebook makes that perfectly clear every time he walks on stage. I can’t say when I’ve heard the role better sung. The great performances don’t stop there though. Josh Quinn’s Enjorlas is a fiery revolutionary, too busy and driven for romantic poses. Chuck Hodges, who recently took home a best actor Ostrander for his performance as Tevye in last season’s Fiddler on the Roof, firmly establishes the show’s well-sung but plainspoken style early in the show as a Bishop who offers Valjean a second chance. 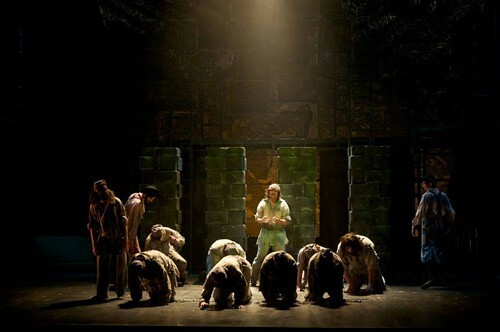 POTS Les Miserables isn’t just populated with great voices. These are voices — human and orchestral — that sound fantastic together. The 2012-13 Ostrander Awards have only just been handed out and already I’m certain that Renee Kemper has secured next year’s prize for music direction. With notable exceptions, Claude-Michel Schönberg’s compositions work more like a movie’s soundtrack than a musical’s score. They speak a language we’ve all grown up with, and use a grammar we instinctually understand. The music fills cracks in the storyline with passages that tell us how much time has passed between scenes, and exactly how to feel about it. In grander productions these sweeping manipulations feel like so much cheating. With spectacle so dialed back, the soundscape becomes the landscape. Suddenly this mega-musical takes on a more decidedly human scale and becomes a storytellers play. As feats of stage magic go, that’s way more impressive than a big mechanical barricade. This production should thrill fans and surprise skeptics. If The Color Purple and Angels in America didn't convince Memphians that Playhouse has upped its game, this should do the trick. For ticket information, this is the CLICK you're looking for. Jerre Dye and Kell Christie's introduction of U of M professor emeritus Gloria Baxter was probably the most moving I've experienced since I started attending the Ostranders (originally the Memphis Theatre Awards) in 1989. And then Gloria's wonderful acceptance speech made the introduction seem like an exercise in understatement. Do yourself a favor and click. If the washed out picture drives you crazy, just close your eyes. It's worth a listen. This year I experienced catastrophic camera failure during the Ostrander Awards, so I won't be able to create the same kind of virtual experience as I have in years past. Still, I am going to post some audio tracks, and also a few iPhone videos, which aren't perfect, but Sister Myotis' monologue must be shared. Turns out Sister's a big fan of The Color Purple. The 30th annual Ostrander Awards were pretty spectacular at the Orpheum Theatre. I'll share some pictures, videos, audio files, and thoughts about both the results and the new venue tomorrow. In the meantime, how about a hand for the winners. It's a map AND a voucher! Are you coming to the Ostranders Sunday? Do you know where you're going to park? 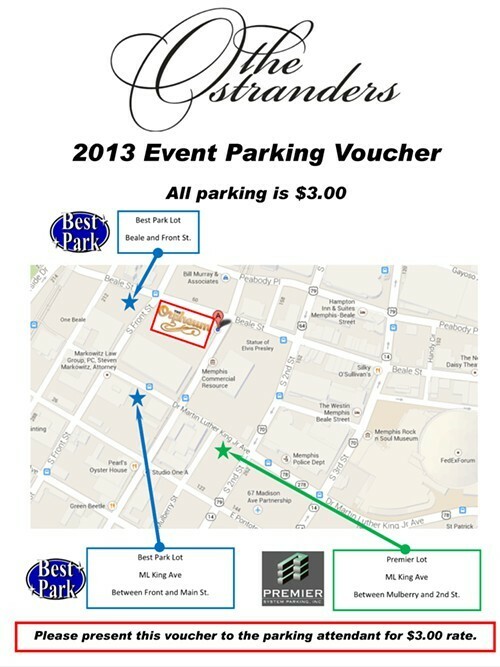 Three lots close to the Orpheum are giving the Ostrander attendees a $3.00 parking rate for the night . The lots (two Best Park parking lots and 1 Premiere Parking lot.) are located at Front Street and Beale, on MLK, Jr. Ave. between Front and Main Street, and also on MLK, Jr. but between Mulberry and Second St.
All of the lots are pay when you park - no paying on the way out. The Best Park lots are cash only. The Premiere lot will accept credit cards with a 25 cent surcharge when you pay upon arrival. However, the Premiere lot (MLK between Mulberry and Second) is also giving us the opportunity to pre-pay for parking online for an additional 25-cents. Instructions for pre-pay and a voucher PDF below the fold. And remember, if you can't print the voucher you can receive the same discount simply by mentioning that you're going to the Ostranders. It's time for the annual, and often pathetic ritual in which I attempt to predict the Ostrander winners and fail miserably. Of course this process is always more fun when others participate, so send me your lists via email, or paste them into comments. I'll dig into my special prize box and find something nice for the person who beats me with the most correct answers. Douglas Gilpin’s designed a perfectly detailed Brooklyn apartment for Time Stands Still at The Circuit Playhouse but the only possible winner of this category is Mark Guirguis. His operatic design for Angels In America, Part I and Part II at Playhouse on the Square would have made Adolphe Appia proud. A Wagnerian set requires Wagnerian lighting. John Horan will win for Angels In America, Part I and II at Playhouse on the Square. 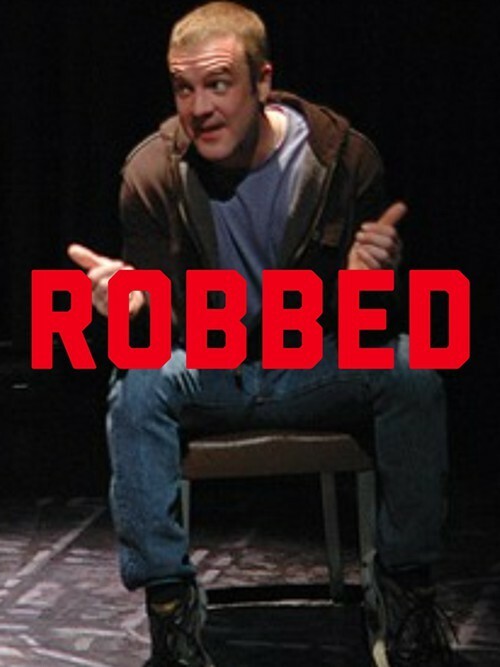 Who got robbed: John Horan is nominated for two shows and his lighting for Angels in America will probably win. But his lighting for Miss Saigon blew me away. I'd rather muck out a stable than sit through another Saigon airlift, but throughout the show I just kept thinking, "This is absolutely beautiful." Robin Owens got to turn Wesley Barnes into Joan Crawford: Ruthless! The Musical Germantown Community Theatre. That smells like Ostrander to me. I’m at a slight disadvantage predicting the musical awards this season since I missed Fiddler on the Roof. But Renee Kemper’s music direction for The Color Purple— like everything else about The Color Purple— was pitch perfect. Emma Crystal’s choreography for The Color Purple Playhouse on the Square was witty and helped to define characters and to tell the sprawling story. It’s some of the best work I’ve seen locally, and it deserves the Ostrander. Mary's wig: So deserving, so robbed. Valerie Houston was the best thing about Ma Rainey’s Black Bottom, and it’s a crime that she wasn’t nominated for that performance. So hopefully she’ll win for The Color Purple at Playhouse on the Square. Who got robbed: Emma Crystal's performance in A Chorus Line was a season highlight. This was a tragic oversight. This is a hard category to call. AJ Bernard did some of his best work to date in The Color Purple but I think the Ostrander may favor Wesley Barnes’ work in Ruthless! or Bill Andrews, who was excellent as Max in Sunset Blvd. I’m going out on a limb and picking Andrews. I’m not exactly what you’d call a Legally Blonde fan but POTS production was pretty perfect and Amy Polumbo gave one of the season’s best performances. But nothing could touch Claire D. Kolheim in The Color Purple, also at Playhouse on the Square. And she’ll win. This was a great year for Playhouse on the Square, with the possible exception of Angels in America, The Color Purple was probably the high water mark. Who got robbed: Ruthless! Was fine, but Michael Duggan has staged this one before, and he's done it better. Although The Color Purple stood head and shoulders over all comers, Altar Boyz, and Legally Blonde were perfectly cast and executed. And Theatre Memphis' A Chorus Line was a fine example of why that show has so much staying power. This was a fantastic year for Liz Sharpe. Personally, I think she should be nominated for her work in Hot L Baltimore. But she’s most likely to win for her performance as a sympathetic pill-head in Angels In America. Who got robbed: Mary Buchignani Hemphill deserved a nod for her work in Good People. Hell, her WIG deserved a nod for its work in Good People. Hurt Village is a true ensemble piece. Every actor is a supporting actor, and every actor has their moment taking the lead. JS Tate and James Cook were both outstanding as denizens of Memphis’ lower depths. But this will probably come down to a contest between David Foster and Dave Landis in Angels in America, if the judges don’t cop out and give them both an award. I’m choosing Landis, because he was clearly having a blast playing a brutish Harry Brock style politician. Kim Justis was great inGood People, as was Kell Christie in Six Degrees of Separation and Aliza Moran in Tally’s Folly. But Tracie Hansom was fearless in Bug. I try to not play favorites, but I want to see Hansom take this. Who got robbed: Leigh Bray Nichols, in a role that strangely echoed her sweeter performance in the musical Violet, was fantastic as a disfigured war zone photographer. And while I have some issues with the play Sylvia, Aliza Moran—thankfully nominated for her work in Tally’s Folly— was brilliant in the title role. I don’t even know why we’re going on with this ridiculous charade. Just give the award to Jerre Dye for his superb scenery chewing in Angels In America, and lets be done. Hilarious and heartbreaking. 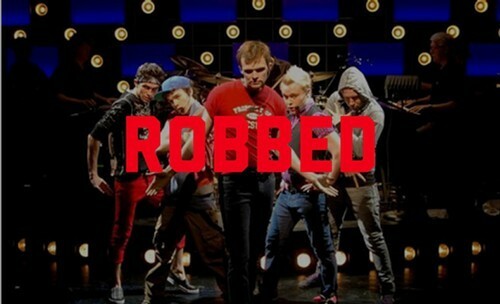 Who Got Robbed: Lots of people. Hurt Village’s two best shots at this award are nominated in the supporting actor category. And even then, they aren’t the show’s most likely leads by a long shot. Where were the nominations for Delvin Brown and Emmanuel McKinney, who were both so deserving as lifelong friends in a place where life is cheap? Also, if I was John Moore, I’d call the police and report a stolen nomination. It takes a lot of cojones to nominate one actor from A Steady Rain, and not the other. Moore did his best work here and got bupkis. Not that it matters much with Dye in the house. This should probably go to either the casts of Hurt Village or Sarifina at the Hattiloo Theatre but I’m predicting a nearly clean sweep for Angels In America. So, Angels it is. John Moore played a cop... And got robbed. Hurt Village was inventively staged, but Irene Crist gets extra points just for taking on an epic like Angels In America. She gets my nod because she knocked it out of the park. I want this to be the year of Hurt Village. But it’s the year of Angels In America. 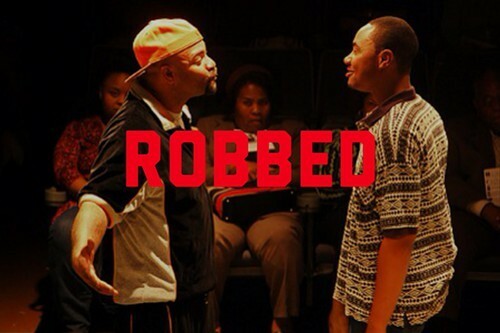 Who got robbed: Time Stands Still earned a few nominations, but in a season packed with showier works I think this powerful, politically savvy show got lost in the shuffle. Too bad, because in any normal season it would have been a highlight, not an also ran. These are my picks and I'm sticking to them. Challengers should submit their picks no later than noon, August 25. 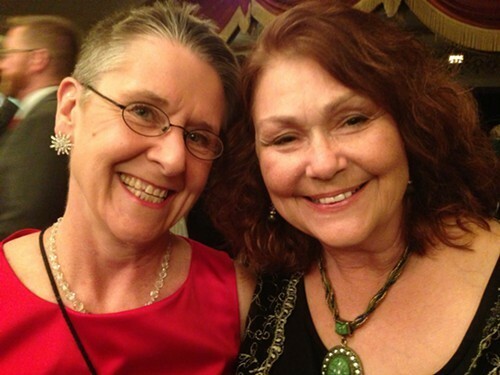 Are you planning on attending this year's Ostrander Awards, Aug. 25 at the Orpheum Theatre? Tickets are now available online. Click here for the details. Justin Asher continues to distinguish himself as one of Memphis' most gifted and versatile performing artists. This weekend he's adding playwright to his list of accomplishments with staged readings of his new play Haint. Intermission Impossible: Since this is a new work, maybe you can tell us a little about what we can expect to see? Justin Asher: What I hope to show you is the story of a woman who holds on to the past so tightly that she can’t live in the present. Mercy, the central character, who used to be a well-known root worker and healer, now secludes herself in her home and depends on her thirty year old son, Charlie, as her only source to the outside world. But, after her son’s death she is forced to deal with life again and along the way discovers the secrets that Charlie had been keeping from her for years. After that, Charlie acting as the narrator, watches as his mother learns to trust people again and let go of the fear and anger she’d been a slave to for years. It’s not a traditional ghost story, but rather a drama that just happens to have a ghost in it. It doesn’t try to be scary. It does however try to make you uncomfortable at moments. It’s really just a story about people as seen by a person who has passed on. Intermission Impossible: I grew up in rural Middle Tennessee and there was a place called "Hainted Holler" so I always immediately associate that version of the word "Haunt" with isolation and more rural traditions. I'm curious as to where you picked up the word, and what images you hope it evokes even before people have experienced the play. Justin Asher: I picked up the word “Haint” from my Granddad. He used to tell me ghost stories from back home and it just sort of stuck. This story is a rural piece which has elements of folk traditions, superstition and hoodoo. The word “Haint” brings to mind, for me, images of light blue porch ceilings and cracked mirrors hung just outside the front door. Both of which were used to keep the spirits away. I have a deep appreciation for those sorts of things. For being respectful of the world you cannot see and looking for the signs and clues it leaves out for us to find. Intermission Impossible: We love telling ghost stories and scaring ourselves silly. As someone playing with the form, what's your take on that? Justin Asher: I really like to be scared. I think it's the adrenaline. I think it's that feeling of knowing that you have no control over the situation, of being powerless - but can feel safe in the knowledge that once the movie is over I will be home safe and sound, on my couch with my dog in my lap. It letting absolute chaos take control of your emotions on the condition that it doesn't stay for long. Yeah, it's something like that. That's why I like it. 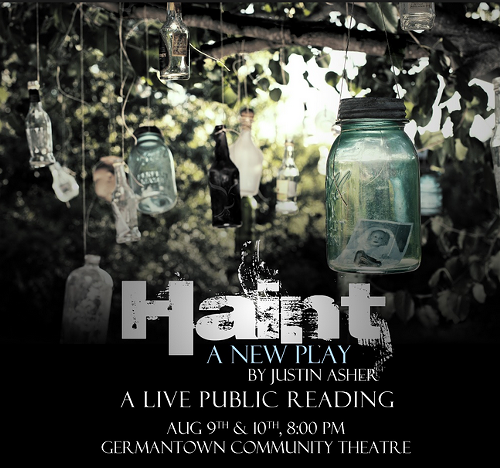 The reading cast for Haint includes Cecelia Wingate, Randi Sluder, Aliza Moran, Jacob Vincent, Greg Alexander Szatkowski, and Stuart Turner. 8 p.m. Friday & Saturday August 9-10. Tickets are $10. Buy the Sky and Sell the Sky: Voices of the South presents "Reasons for Falling"
"It's only loosely based on the story of Icarus," says playwright/director Leslie Barker. Barker's good at saying what Reasons for Falling, the new play she's co-written with Joe McDaniel isn't, but struggles to say exactly what it is. It's not because she doesn't know. But sometimes she knows in pictures instead of words. "I'm the image person," She says. Joe was always asking, 'Okay, what's the story." Barker describes images from her early life in the rural South. She describes a big uncrossable river. She describes a young person struggling to determine if he's human or something more. And she talks a lot about music, and bands like REM and The Magnetic Fields. The characters, she says, are music lovers and regularly play games that involve song lyrics. 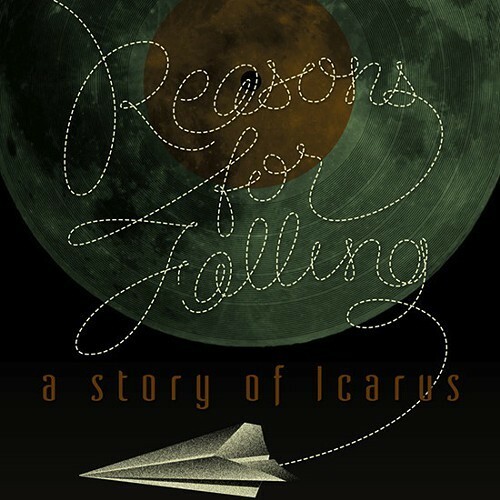 So what exactly is Reasons for Falling: A Story of Icarus? It's an impressionistic tale of teen angst, Bible stories, and small town dreaming. It's set in a world where angels and prophets are real, but don't always know how real they are. Voices of the South is committed to developing work by regional authors and, in a town where most theatricals are imported, the spunky independent had incredible successes with full-length original works by Steve Swift (Sister Myotis), and Jerre Dye (Cicada); Elaine Blanchard's Prison Stories; and various other new and adapted works by company members. Reasons for Falling, with an original score by Jeff Lusk, is Voices' latest debut.